As I read through this chapter there is an underlying word and message that I can see, or should I say sense, between the lines. The word and message is Grace. I love that word and I love that message! Lets see if you see and sense the same thing. Cecil writes, "Instead of seeking to modify and reshape your personality, I plead with you to accept, value, and nurture yourself. Why don't you become more fully who you already are? In the process, you mature and your writing improves." "To carry this further," Cecil says, "doesn't it make sense that the better you know yourself, the better you write? Thus the more honestly you write, the closer you come to knowing who you really are." I find the statements Cecil makes incredibly encouraging. Not only to be embraced in writing but in life as a whole. Sometimes the world's ways may lean towards being programed, somewhat like clones. Our own uniqueness is seen as narcissistic or from a religious point of view it may be seen as rebellious. Instead of an appreciation for our individuality and our gifts as being recognized as God given, we are encouraged to get with the program or to get out. But as a believer in the Christian faith, I believe God created us to be authentic and to live authentically. To write with authenticity. Cecil says that for the past decade he has encouraged writers to value their uniqueness. He urges us to embrace "our divinely given personality and ability." He encourages us to get excited about our uniqueness, and use that knowledge to make ourselves an increasingly effective writer. Cecil goes on to advise us as writers to acquire skills to do our job efficiently and to honor our ability and to enjoy being who we are. He says, "Perhaps your weaknesses may not be the negatives you think they are." He writes, "If you learn to capitalize on who you are and appreciate who you are, you're on your way to becoming the best writer you can become." Cecil expresses that he does not advocate rigid self-discipline. "I tried that". He goes on to say, "For years, I held to tight schedules, refused to allow deviations, and castigated myself when I failed. I've since learned that true self-discipline flows out of gentleness and self-respect." He gives an illustration of what he means. He writes, "People call me transparent, real, and honest and I'm getting more that way all the time. I haven't always been vulnerable on paper. During my first years of writing, my initial attempts were a bit pompous and condescending." 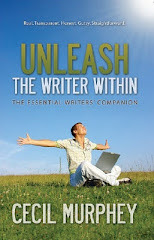 "Only by knowing who you are and compassionately embracing yourself can you grow as an individual and as a writer. If you relentlessly pursue self-understanding, accept your own experiences as authentic, and are willing to compose from that truer, deeper part of yourself, you generate the kind of writing that comes across as authentic. Honest. True." Sounds like true grace and grace-filled advice to me !! The Aphorism for today is: "The better I know myself, the better I write. The better I like myself, the better writer I become." the better writer I become."